Hypoplastic left heart syndrome (HLHS) is a single-ventricle congenital heart disease that is fatal if left unpalliated. In HLHS patients, the tricuspid valve is the only functioning atrioventricular valve, and its competence is therefore critical. This work demonstrates the first automated strategy for segmentation, modeling, and morphometry of the tricuspid valve in transthoracic 3D echocardiographic (3DE) images of pediatric patients with HLHS. 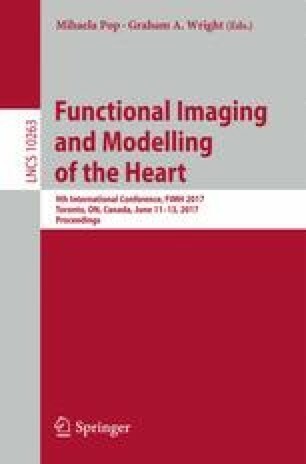 After initial landmark placement, the automated segmentation step uses multi-atlas label fusion and the modeling approach uses deformable modeling with medial axis representation to produce patient-specific models of the tricuspid valve that can be comprehensively and quantitatively assessed. In a group of 16 pediatric patients, valve segmentation and modeling attains an accuracy (mean boundary displacement) of 0.8 ± 0.2 mm relative to manual tracing and shows consistency in annular and leaflet measurements. In the future, such image-based tools have the potential to improve understanding and evaluation of tricuspid valve morphology in HLHS and guide strategies for patient care. This work was supported by grant numbers EB017255 and HL103723 from the National Institutes of Health, as well as the Children’s of Hospital of Philadelphia Department of Anesthesia and Critical Care Medicine, Cancer Care Ontario with funds provided by the Ontario Ministry of Health and Long-Term Care, the Natural Sciences and Engineering Research Council of Canada (NSERC), and the Neuroimage Analysis Center supported by the National Institute of Biomedical Imaging and Bioengineering (P41 EB015902).